Note – Before beginning installation, please ensure you have uninstalled any other antivirus and firewall products that are on your computer. Click here to read the full note. 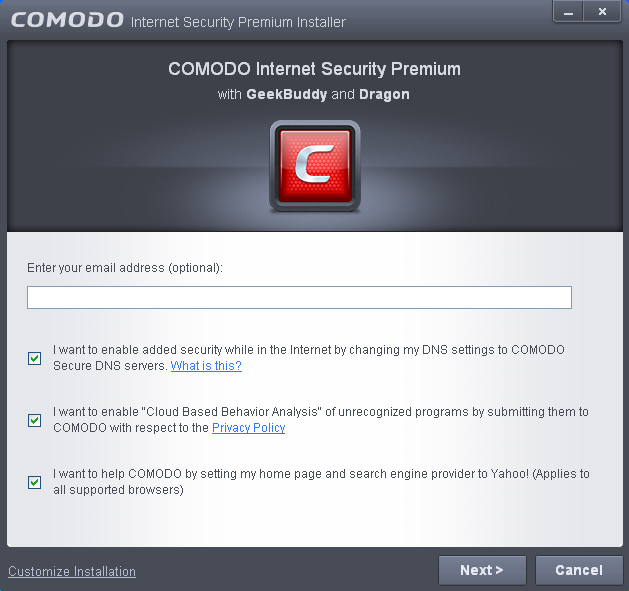 Comodo Internet Security Pro 6.3 can be downloaded from http://www.comodo.com/home/download/download.php?prod=cis-pro after signing up for subscription and includes, Comodo Dragon, GeekBuddy and the Comodo Guarantee. The installation wizard starts automatically and the 'Select the language' dialog is displayed. 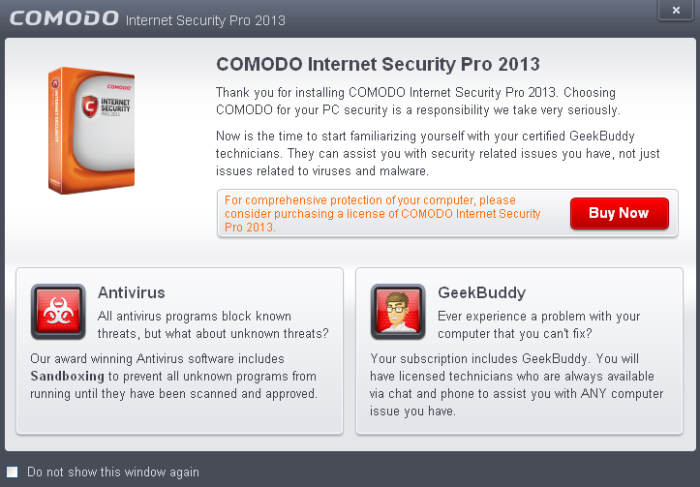 Comodo Internet Security is available in several languages. 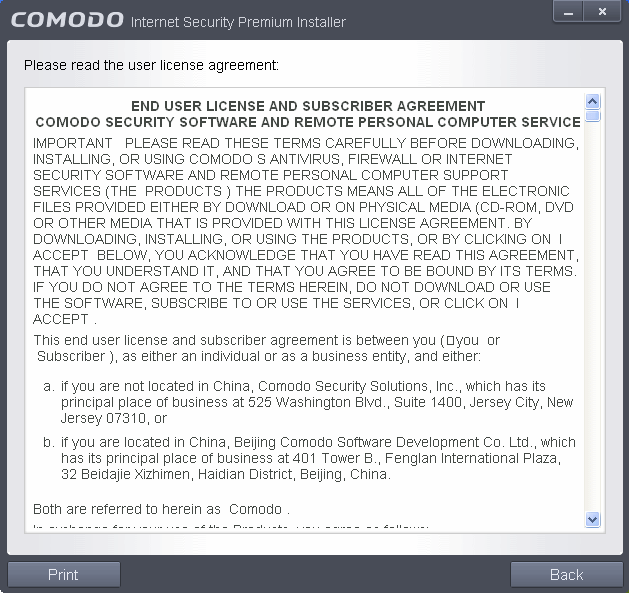 Select the language in which you want Comodo Internet Security to be installed from the drop-down menu and click 'OK'. If you click ‘Customize Installer’ then you can choose advanced options. These include which CIS components you wish to install, the ability to choose CIS installation path and other advanced CIS configuration settings. 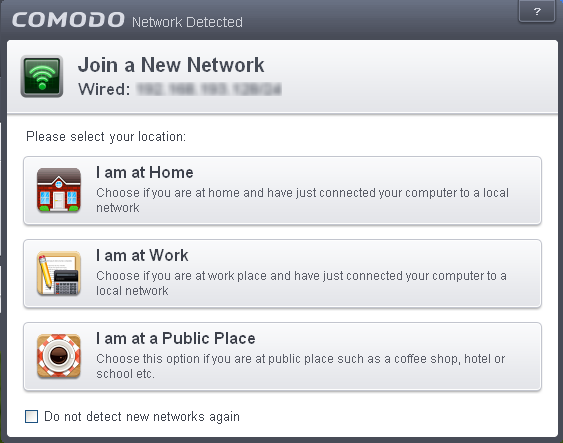 In this step of installation of Comodo Internet Security, the DNS settings of your computer can be changed automatically to direct to our DNS servers. You can disable the service at anytime and revert to your previous settings. 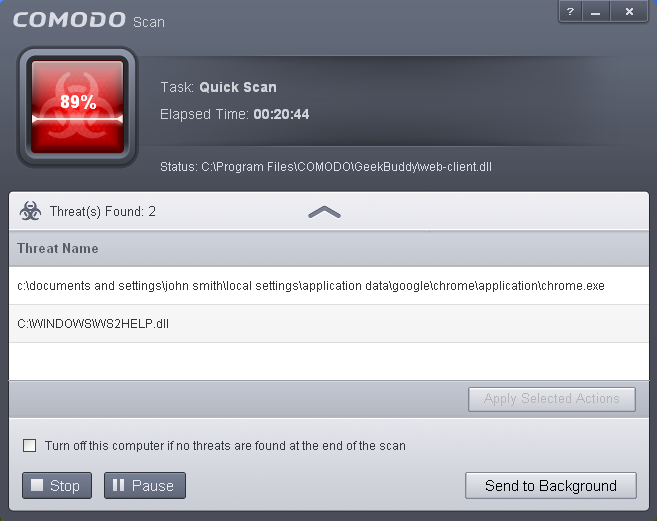 To enable Comodo Secure DNS, select ‘Change my DNS Servers to COMODO SecureDNS Servers. Click the 'What is this' link to know more about Comodo Secure DNS servers. Read the complete User License Agreement by clicking the 'User License Agreement' link before proceeding with the installation. 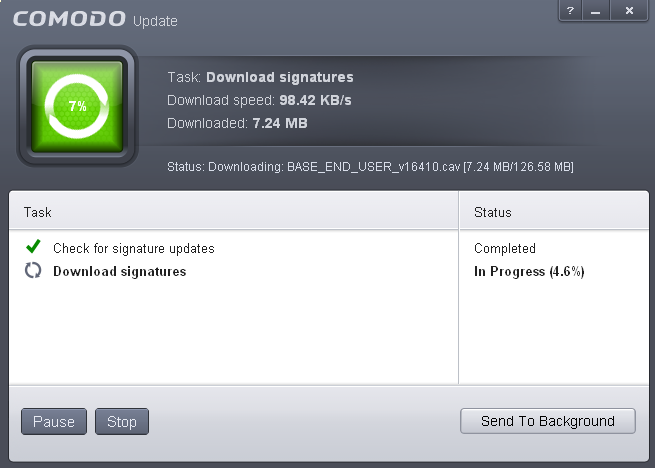 Once back at the main installer screen, if you wish to configure advanced options, click ‘Customize Installer’. Otherwise, click ‘Agree and Install’ to begin installation. 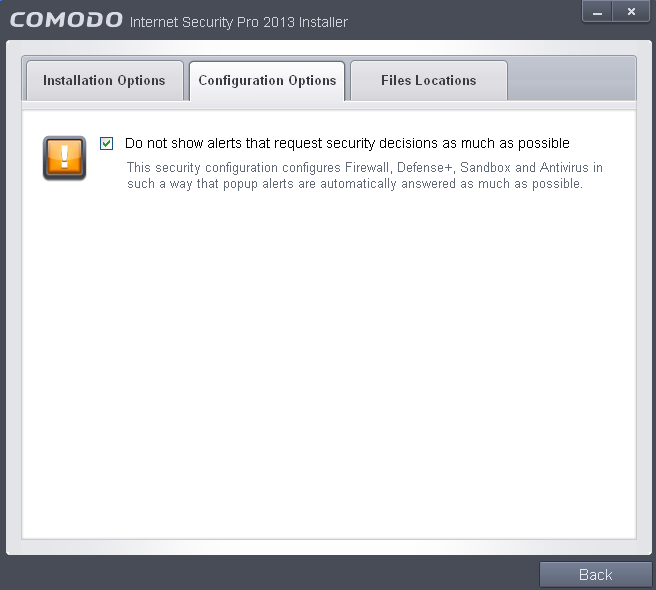 Clicking the 'Customize Installer' link opens an advanced options interface that enables you to choose which elements you would like to install, configure security popup alerts and choose the installation path. 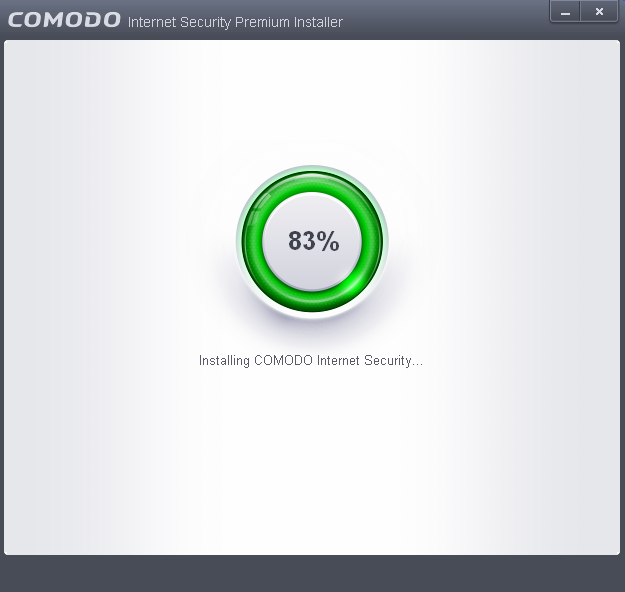 In order to obtain maximum protection, Comodo recommends that you uninstall any third party personal Firewall and Antivirus in your system and select all the components to get the maximum benefit from Comodo Internet Security Pro 6.3. 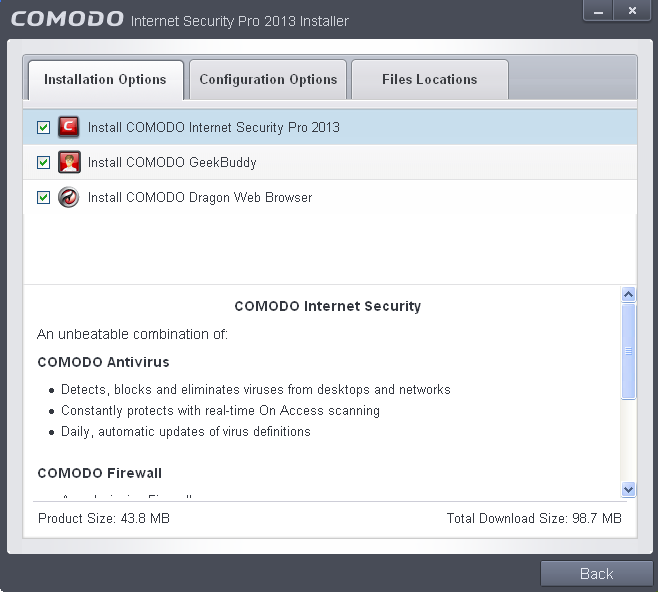 Install COMODO Internet Security Pro 6.3 - Selecting this option installs Comodo Antivirus, Comodo Firewall and Defense+ components. Installing CIS Pro 6.3 is a mandatory requirement if you are a Pro or Complete customer. 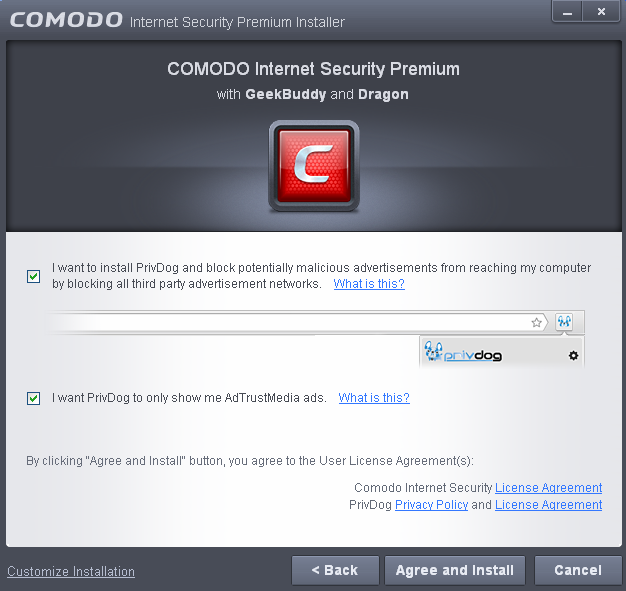 Install COMODO Dragon - Selecting this option installs Comodo Dragon, a fast and versatile Internet browser based on Chromium technology and infused with Comodo's unparalleled level of security. Refer to the section Comodo Dragon for more details. Click the ‘Configuration Options’ tab to configure pop-up alert options. 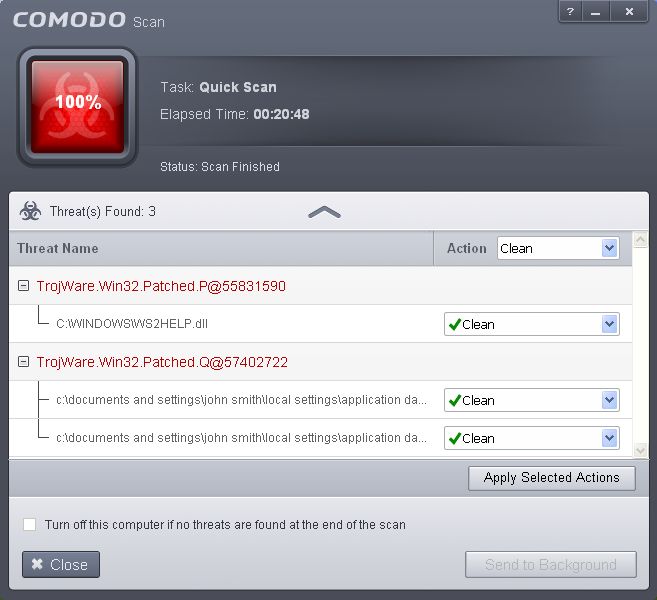 This screen allows you to select the folder in your hard drive for installing Comodo Internet Security. 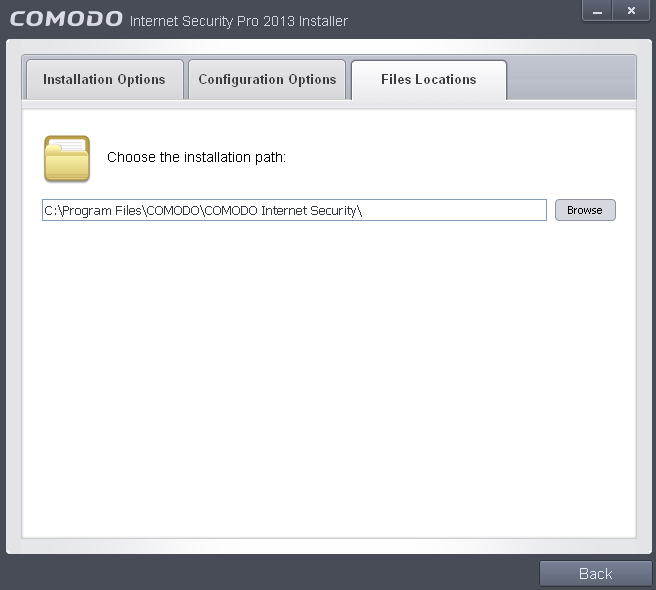 The default path is C:\Program Files\COMODO\COMODO Internet Security. If you want to install the application in a location other than the default location, click 'Browse' to choose a different location. After restarting, a ‘thankyou’ screen will appear. This contains a summary of the components you chose to install as well as some friendly advice. You can also purchase license key from this screen if you have not done so already. If you do not want the scan to continue at this time, click the ‘Stop Scan’ button. Important Note: After successful installation, you need to activate the license for using the product. In order to get your guarantee coverage, you need to activate the license first.